A Clearer View | Latest treatment options and news about cataracts, dry eye syndrome and other eye care topics. 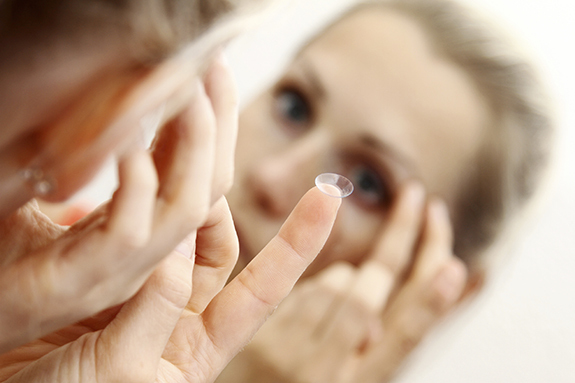 Some of the most common complaints among contact lens wearers are symptoms of dry eyes. The itchiness, scratchy feeling, redness and general discomfort of dry eyes can make life truly miserable. So, what can you do about it? The truth is wearing contact lenses doesn’t cause dry eyes, but it can bring out symptoms in people prone to dry eye syndrome, a condition that affects more than 90 million Americans. That’s up to 30% of the U.S. population. Dry eyes result from an insufficient coating of natural liquid across the front of the eye. This liquid is a mixture of tears and oils that help flush out debris and let the eyelid slide across the eye. Wearing contact lenses can reduce the amount of liquid on the eye by absorbing it into the lens. This sometimes results in CLIDE: contact lens induced dry eye syndrome. Use of lubricating eye drops may offer some relief, but rarely produces long-term comfort. Certain contact lens cleaning products can also help keep your contacts moist. Your eye doctor can help guide you to the best products for your specific needs. Many contact lens wearers eventually find their dry eye problems are actually rooted in their eyelids. Along the ridge of the eyelid are tiny vents for oil-producing glands called meibomiam glands. The lipids produced by these glands are designed to spread across the surface of the eye each time we blink. When they become clogged, evaporative dry eye disease can result. Thankfully, there are treatment options for evaporative dry eye disease. Among the most effective solutions is LipiFlow, an in-office treatment that unblocks the meibomiam glands vents, allowing the naturally occurring oils to flow freely and lubricate the eyes once again. If you’re having trouble with dry eye symptoms while wearing contact lenses, schedule an appointment with Gainesville Eye Physicians today. We’ll talk with you and evaluate your symptoms to create a treatment plan perfect for you. Dry eye syndrome is among the most common vision problems in the United States. 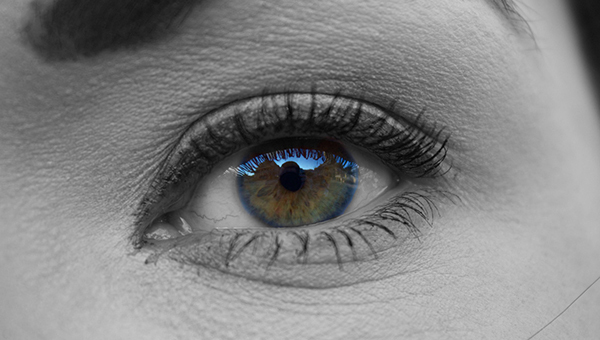 A recent survey found nearly 48-percent of Americans regularly suffer from dry eye symptoms. Dry eyes result from a lack of proper lubrication across the surface of the eyes. Healthy eyes have a moisture layer made up of a combination of mucus, saline (salt water) and lipids. Insufficient amounts of these components, or the wrong mixture of them, causes irritation, sandy or gritty feeling, burning sensation, redness, blurred vision and other dry eye symptoms. Several factors can contribute to dry eyes. Dry eyes can affect people at any age, but the condition is much more common in people age 50 and older. By age 65, most people regularly experience dry eye symptoms. Due to hormonal changes, women are more likely than men to develop dry eyes. Events including pregnancy and menopause may trigger dry eye symptoms. While dry eyes are more common in women, studies suggest more than 1.6 million American men also have the condition. Antihistamines, blood pressure medications, decongestants and antidepressants can contribute to a reduction in tear production. Of course, these medications serve important purposes, so you should not discontinue use, even if you experience dry eye symptoms, without consulting your physician. People with diabetes, rheumatoid arthritis, lupus, scleroderma, thyroid disorders, vitamin A deficiency and some other conditions are prone to develop dry eyes. Dry eye symptoms are also fairly common in patients following LASIK surgery. 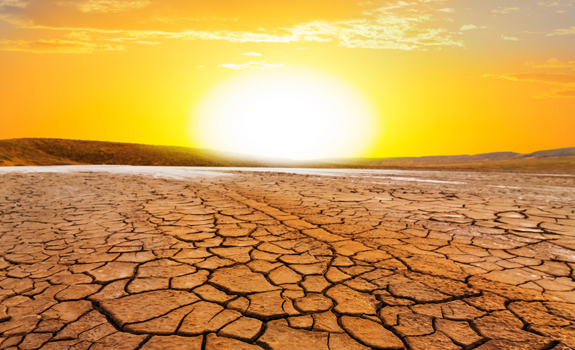 Living in or visiting dry environments can lead to dry eyes. Factors such as smoke and wind also play a role. Dry eyes may also affect people who stare a computer screens for long periods, as they may blink less frequently. If you experience dry eye symptoms, contact Gainesville Eye Physicians today for a consultation. We’ll examine your eyes to diagnose the cause of your discomfort. Depending on the nature of your condition, we can provide several treatment options, including LipiFlow if your dry eyes are caused by insufficient lipids. You can experience dry eye relief. We can show you how. Undergoing any surgical procedure must be taken seriously. And the more information you have, the better choices you can make when comparing your surgical options. This is especially true when considering cataract surgery. Do your homework and ask as many questions as necessary until you are 100-percent comfortable proceeding. Is now the right time for cataract surgery? Being diagnosed with a cataract doesn’t necessarily mean you need surgery right away. In the early stages, cataracts may not negatively affect your vision. If, however, your vision is blurred, it’s time to act. Eventually, all cataracts require surgery. What are my cataract surgery options? Cataract surgery can either be performed via tradition surgical methods or laser assisted surgery. Laser-assisted cataract surgery is the preferred method for most patients, as it allows the surgeon to be more precise, limits patient discomfort and speeds recovery. 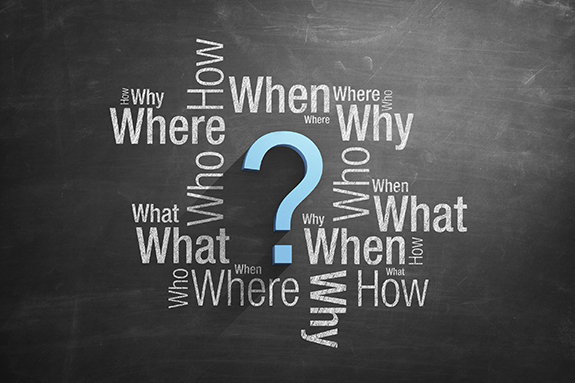 How many cataract surgeries have you performed? Your eyes are precious, so you want to trust them to a surgeon with an excellent reputation and a successful track record. Like most things in life, there’s no replacement for experience. In North Central Florida, Dr. Gregory Snodgrass is among the most experienced, having performed more than 20,000 cataract surgeries. Recovery times, side effects and follow-up appointments are heavily impacted by the skill of the surgeon and the type of cataract surgery you choose. Laser-assisted cataract surgery and recovery are pain free. Limited trauma to the eye reduces side effects compared to traditional cataract surgical procedures. How much will my vision improve? With the cataract removed and a new prosthetic lens implanted, you can expect substantial vision improvement. With laser-assisted cataract surgery, patients often experience improved vision before even leaving the surgical center. Cataract-related vision problems are permanently corrected, but patients with other vision problems may still need to wear glasses or contacts. If you suspect you have cataracts, contact Gainesville Eye Physicians today for a consultation. We’ll perform an evaluation, review your treatment options and answer any and all questions you have. We’re here to help you see clearly. Dry Eyes? Could be Your Glands – Really. When most people hear the word glands, they think of those mysterious little organs that cause hormones to swirl in teens. But those certainly aren’t the only glands in your body. In fact, if you suffer from dry eyes, it’s glands that could be the root cause of the problem. We’re talking specifically about your meibomian glands, also called tarsal glands. Meibomian glands are located within the eyelids, approximately 50 glands in the upper eyelids and 25 in the lower eyelids. Each tiny gland has a vent (small opening) along the edge of the eyelid through which they express meibum, an oily substance that helps maintain eye moisture. When we blink, that meibum is carried from the eyelids across the eye’s surface. Meibum’s primary function is sealing in the natural moisture produced by tears against the eyeballs. When meibomian glands stop effectively producing and distributing meibum, dry eye symptoms result. It’s called evaporative dry eye disease, and it can be quite painful. Evaporative dry eye disease symptoms include burning, itching, watering, light sensitivity and recurring blurred vision, among others. The disease is somewhat more common in women that in men, but anyone can be affected. Treatment for evaporative dry eye disease has come a long way in recent years. Traditional treatments including warm compresses, eye drops and prescription medications provide temporary symptom relief, but don’t cure the cause of the problem – lack of healthy, normal meibum production. Thankfully, now there is LipiFlow. This revolutionary treatment uses a combination of warmth and compression to unblock meibomian glands, allowing them to effectively do their jobs once again. LipiFlow treatment can be applied at your eye doctor’s office and is shown to provide comfort to 86% of dry eye patients. Gainesville Eye Physicians is one of first eye health practices in North Central Florida to offer LipiFlow and our patients experience fantastic results. To learn more about evaporative dry eye disease and LipiFlow, contact Gainesville Eye Physicians today. Developing cataracts can be incredibly frustrating. Early on, their impact on vision is limited, but the condition inevitably grows worse over time. Without treatment, cataracts effectively rob patients of their vision. So, how do you know if you or someone you love is developing cataracts, and what cataract treatment option is best? Let’ start with a list of some common cataract symptoms. Cloudy or blurred vision –This will likely impact only a small area of vision at first. Your vision may be blurry when looking one direction but not another. Eventually, however, it will take over your entire field of view. Double vision –Double vision is a dangerous early symptom for cataract patients. It can produce balance issues that can result in falls or hazardous driving. Lens discoloration –Patients with lens discoloration notice that colors dull, often distorted as if by a brown or yellow film. Purples and blues can be particularly difficult to see. Light sensitivity, glare and halos –Lights (natural and synthetic) can be far too bright for people with cataracts. They can also produce uncomfortable glare or disorienting halos. If you or a loved one is coping with any of these symptoms, see your eye care provider for a cataract screening. 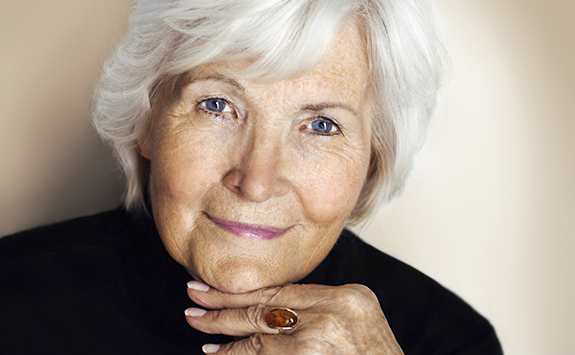 If you do have cataracts, ask about your treatment options, including laser cataract surgery. Cataracts don’t go away on their own, and they can’t be cured with medications. Surgery is the only effective treatment option. So, the question that remains is whether you should choose traditional surgery or laser surgery. At Gainesville Eye Physicians, we recommend LenSx Laser System for most patients. LenSx laser cataract surgery has many benefits over traditional surgical methods. It’s pain-free and promotes faster recovery. Some patients report improved vision within minutes or hours, even before they leave the surgery center. LenSx is also completely bladeless and significantly more accurate than manual procedures. If you experience symptoms including dryness, grittiness, soreness, irritation, burning and eye fatigue, you may be one of more than 100 million people worldwide who suffer from dry eye syndrome. 65% of these people have a specific condition known as Evaporative Dry Eye Disease, a condition Gainesville Eye Physicians can now treat with an innovative new treatment option called LipiFlow. Evaporative Dry Eye Disease isn’t just uncomfortable; it can cause serious vision impairment. Symptoms result from an insufficient quantity of oily lipids in tears. These lipids normally create a film over the eyes that prevents tears from evaporating and, thus, keep eyes well lubricated. When these lipids are not present in high enough concentrations, people lose the protective layer, resulting in pain. The cause of this deficiency stems from blocked glands along the rim of the eyelid known as meibomiam glands. Traditional dry eye treatments – warm compresses, over- the-counter wetting drops and ointments and prescription drugs – treat the symptoms, but fail to address the root cause of Evaporative Dry Eye Disease. LipiFlow, unlike historical treatments, unblocks meibomiam glands, allowing them to resume normal oil secretion and produce a healthy lipid layer. An in-office treatment, LipiFlow is proven to provide exceptional results for most patients. In studies, four weeks following the procedure, researchers observed two to three times more meibomian gland output in patients treated using LipiFlow. During that same time, 79% of patients reported improvement in their dry eye symptoms. Gainesville Eye Physicians is among the first eye care practices in North Central Florida to offer this exciting treatment option. If you have been diagnosed with Evaporative Dry Eye Syndrome, or have dry eye symptoms, contact Gainesville Eye Physicians today and ask about LipiFlow. 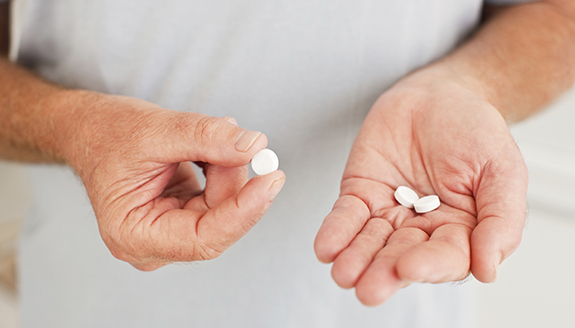 Millions of Americans take corticosteroid medications daily to address a variety of health problems, from arthritis to asthma. While these prescription drugs often deliver considerable health benefits, users should be aware of the link between steroids and the risk for cataracts. Studies show that long-term use or high-doses of steroids can promote cataract formation. People taking a combination of oral and inhaled steroids are at the highest risk. In a study reported by the American Academy of Ophthalmology, seven out of 10 patients who “at the start of the study had ever used inhaled steroids, had used oral steroids for at least one month and had no cataracts,” were found to have cataracts in follow-up exams. The specific types of cataracts known to be promoted by steroids are called subcapsular cataracts. These cataracts develop near the back of the eye lens, forming opaque patches that inhibit the passage of light to the retina. Subcapsular cataracts often produce glare or halos at night, interfere with reading and limit vision in bright conditions. Patients taking corticosteroids should schedule regular screenings with their eye doctor to diagnose any cataract development. If diagnosed early, your eye physician can make recommendations to help slow cataract development. In the beginning, when vision is only slightly blurred by the cataract, it may be possible to adjust your eyeglasses prescription to compensate. Eventually, however, surgery will be the only effective treatment option. Cataract surgery is generally an outpatient procedure that can be performed using local anesthetic. A tiny incision is made and the cloudy lens removed. An artificial lens implant known as an intraocular lens (IOL) implant is put in its place. New laser-assisted cataract surgery options make the procedure pain-free and reduce the time required for recovery. Patients often report improved vision on their way home following the surgery. If you are taking oral or inhaled steroids, contact our office today to schedule an eye examination and cataract screening. Living with cataracts can be extremely frustrating, as if everything you see is through a sheet of frosted glass. The only way to clear the fog is through surgery. Cataract surgery has come a long way over the years, including new LenSx® laser technology. But what makes laser-assisted cataract surgery a better option? Traditional Cataract Surgery: The surgeon manually cuts a small incision in the cornea – the transparent layer that forms the front of the eye. Making the incision requires extreme concentration and an exceptionally steady hand. In some instances, it’s necessary to cut a larger incision which requires stitches to close. Those stitches are removed weeks later. LenSx® Laser-Assisted Cataract Surgery: The LenSx® system carefully maps the eye using micro-imaging cameras to feed data into the computer. The surgeon then identifies the ideal location for the incision and programs the laser to make the perfect cut. LenSx is significantly more accurate than manual cataract surgery. Traditional Cataract Surgery: A small probe is inserted through the incision. The probe emits ultrasonic waves that break up the lens. Substantial ultrasonic energy is applied to essentially liquefy the majority of lens which is then vacuumed out by the probe. A second probe is then inserted to remove the remaining pieces. LenSx Laser-Assisted Cataract Surgery: The LenSx® system requires half the ultrasonic energy to break up and soften the affected lens compared to traditional methods. This means less trauma to the eye and less inflammation. That translates to pain-free surgery for the patient. Traditional Cataract Surgery: A new artificial lens, called an intraocular lens (IOL), is inserted in place of the removed lens. The IOL is usually curled up in an injector that again passes through the incision. The IOL is deposited, uncurls and settles into position. LenSx Laser-Assisted Cataract Surgery: The sequence of steps is identical to traditional cataract surgery at this stage, but computer mapping ensures the IOL injector makes it smoothly through the incision and deposits the IOL in the precise position for optimal vision. Traditional Cataract Surgery: Recovery time and side effects depend largely on how well the surgery was performed, but most patients return home with a few hours of surgery. It's common to experience discomfort in and around the eye for up to a few days. Other side effects may include an itchy or sticky eye, blurred vision, a feeling of grittiness and mild headache. LenSx Laser-Assisted Cataract Surgery: The surgery and recovery are pain free. In most cases, the patient’s vision improves almost immediately after the procedure. Reduced ultrasonic energy used during a LenSx® cataract surgery reduces trauma-related side effects. Gainesville Eye Physicians is the only practice in the greater Gainesville area to offer the LenSx® laser-assisted surgical system. Contact our offices today to discuss your cataract treatment options. There are two main cataract treatment options: phacoemulsification (also known as phaco) and extracapsular. At Gainesville Eye Physicians, we use phacoemulsification, which is generally safer and far less invasive. But whichever treatment option you choose, there are some common things you can expect after your cataract is removed. After your surgical procedure with Dr. Snodgrass, your vision will improve within just a few days. Vision may be temporarily blurred as your eye heals and adjusts to the artificial lens, but you can expect regular improvement in the days after treatment. Some patients experience improved vision almost immediately after surgery, especially those who opt for our LenSx laser-assisted cataract surgery option. LenSx surgery is completely bladeless and pain-free. 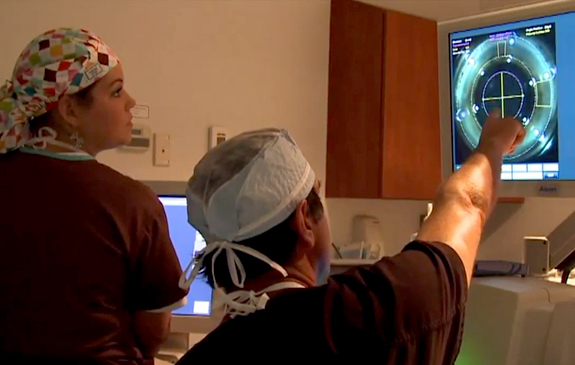 The system captures high-resolution images of the eye and provides detailed measurements, allowing a computer-guided laser to make precise incisions. It’s significantly more accurate than manual procedures. It also requires less ultrasonic energy for less risk and inflammation. These symptoms should improve quickly with proper protection and care. Generally, cataract treatment has very few side effects – just clear vision and a happier life. If you ever want to see an optician cringe, use your t-shirt to “clean” your eyeglasses in front of her. It’s the eye care industry equivalent of fingernails on a chalkboard. After regaining her composure, which could take five to seven minutes, she’ll surely explain there are better ways to clear debris from your lenses. So, why shouldn’t you clean your glasses with your shirt, tie, scarf or any other clothing? Clothes fibers trap particles that can easily scratch lenses and scratches result in blurred vision. Using rags, paper towels or facial tissues can also create scratches. The best way to clean your glasses is using your fingers to rub down the lenses with simple soap and warm water. Then pat them dry with a clean, microfiber cloth. Your optician likely provided you an eyeglass cleaning cloth when you got your glasses. If you don’t have one, stop by our optical shop in Gainesville to buy one. Alternatively, you can buy pre-moistened lens cleaning tissues online. Or if want to be fancy, you can buy an ultrasonic cleaner. The nice thing about the ultrasonic cleaner is it can also be used to clean jewelry, DVDs any other delicate items. Arguably the most important thing you can do for the long-term well-being of your eyeglasses is keep them in a case anytime you’re not wearing them. Yes, anytime. As soon as they leave your face, they should be placed directly into their case. Hey, that rhymes. Maybe that will help some people remember. How often have you taken off your glasses in the car and tossed them down on the passenger seat? Or placed them on the nightstand, only to find the next morning that the cat has swatted them to the floor? Another common no-no is setting your glasses lens-side down. A sturdy case keeps your glasses safe and sound, shielding them not only from damage, but also from exposure to dirt and dust. For why that’s important, please re-read our “clean responsibly” tip. The most common damage to eyeglass frames results from the way people take them off their faces. You know, the old one-hand, 45-degree tug. The wearer uses his dominant hand to grab the frames near the hinge and pulls them off. Before long, this stretches the frames and negatively impacts their fit. You should always use both hands to remove your glasses. With one hand on each side, grasp the temples and slide your glasses forward. Voila! It might sound silly, but taking your glasses off the right way can add years to your frames. Once they’re off, don’t undo all the good you just did by propping them atop your head. Yes, it looks cool, but it’s a quick way to stretch out your frames. Not only that, but they’re also unstable up there. Next thing you know, they fall to the ground and get stepped on. And that’s not cool at all. If you’re in the market for a new pair of designer prescription eyeglasses or sunglasses, stop by one of our Gainesville optical centers – in Tioga Town Center and on East University Avenue. Just promise us you won’t clean them with your t-shirt.